FILE - President Barack Obama and his daughter Malia on April 7, 2016. WASHINGTON -- President Barack Obama marked a big milestone Friday: His daughter Malia graduated from high school. Malia was 10 and longing for the puppy her father had promised when her family moved to the White House. She's grown up in the public eye ever since, getting and shedding braces, being taught how to drive by Secret Service agents and spending short stints away from her parents and sister. Obama has said it hasn't been easy watching "one of my best friends" grow up so fast, in front of the world. Obama has blamed his emotions for declining an invitation to deliver Sidwell's commencement address as then-President Bill Clinton did in 1997 when his daughter, Chelsea, graduated from the same school. Malia's younger sister, Sasha, who turned 15 on Friday, attends Sidwell, too. After Friday's graduation ceremony, the Obama family celebrated over lunch at Cafe Milano in Georgetown. What's next for Malia? She's taking a year off before enrolling at Harvard in the fall of 2017. The Obamas haven't disclosed Malia's plans for her "gap year," but delaying college could keep her close to her tight-knit family as it prepares for the end of Obama's presidency in January. The Obamas plan to stay in Washington for several years after he leaves office so Sasha can finish school at Sidwell. The Obama girls were the youngest kids to grow up at the White House since President John F. Kennedy's children, Caroline and John Jr., more than a half century ago. Obama has joked it comforts him to know that his girls are being watched over by "men with guns" - Secret Service agents. Malia has traveled to Europe, Africa, Asia, South America and the Caribbean with her parents, and taken a school trip to Mexico. She's met celebrities and high-powered people, including two popes. Michelle Obama has said her daughter wants to be a filmmaker. Malia has had summer internships on the New York set of HBO's "Girls" and in Los Angeles on a CBS sci-fi drama, since canceled, that starred Halle Berry. The experiences allowed her to sample life on her own, though not outside the reach of her Secret Service protectors. The pre-teen whose swing set still sits just outside the Oval Office now turns heads when she's spotted around town - including driving her car. 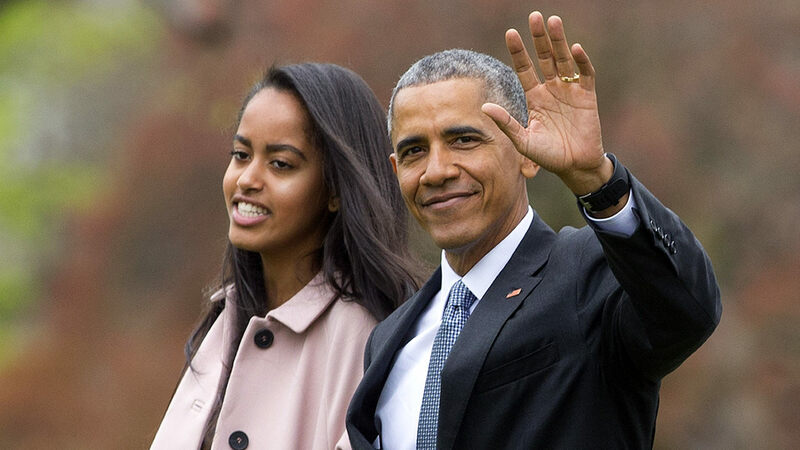 Malia turns 18 on July 4, in time to cast her first vote for president - and for her father's successor.